1) Prepare mix according to instructions on the box. 2) Combine all ingredients in either of the filling recipes. 3) After the bread batter's first 30 minute rise, stir it down and lightly grease an 8 1/2" X 4 1/2" or 9" x 5" loaf pan. 4) Spread about 1 1/4 cups batter in the bottom of the pan and follow with 1/3 of the filling, taking care to leave a 1/2" border around the edges to ensure sealing. 5) Repeat the layering process with two more layers and a final layer of bread batter on top so that there are three layers of filling and four of the bread mix. 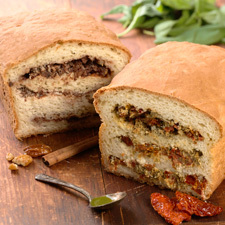 Leave the middle of the loaf domed in a traditional shape and smooth the surface gently with wet fingers. 6) Cover the pan with greased plastic wrap, leaving room for expansion. Allow the bread to rise for 20 to 40 minutes, or until it's crowned about 1" above the rim of the pan. Towards the end of the rising time, preheat the oven to 350°F. 7) Remove the plastic wrap. Bake the bread until it's golden brown and the internal temperature registers 200°F to 210°F (about 50 to 60 minutes). Remove the bread from the oven, and turn it out of the pan onto a rack to cool. Cool completely before slicing.